Work in an Office Treehouse - Treehouse by DesignTreehouse by Design - So, you thinking about building a tree house? Okay so maybe you never got that treehouse you always wanted as a child. And maybe you don’t have the space or the time to build one of your own anytime soon. Sounds like you need an office treehouse. Introducing Treehouse 2. These innovative office designs by Dymitr Malcew, and pictured above, are inspired by the look and feel of real treehouses. The natural-looking wood exterior encases a cozy little office nook that allows you to get away from it all while being right in the middle of everything. You can operate solo or wheel two pods together to create an intimate space for two to four staff. Of course, you don’t have to mix business with pleasure. You can simply use this pod in your home as a little place to get away from home life for a while. Kids who live in rural settings would also benefit from these cozy nooks. They’re the ultimate combination of treehouse and fort! It’s an interesting idea. I’d like to see studies on office productivity compared to more open, less personal office environments. If you need others to motivate you, this hideaway may not be for you. If you’re self-motivated and introspective, however, this might be the perfect place for you to do your best work. In recent times we’ve been blessed by highly portable technology that allows many of us to escape the office cubicle and work from wherever we want. If your workplace isn’t willing or able to provide you with a funky, cozy office treehouse, you may be in a position to make your own office treehouse at home or even build an honest to goodness treehouse you can work in. Treehouses are about using our creativity and imaginations so office treehouses don’t have to be limited to ideas along the lines of Treehouse 2. Take, for instance, this chic rentable outdoor office treehouse, which wraps itself around an outdoor tree. 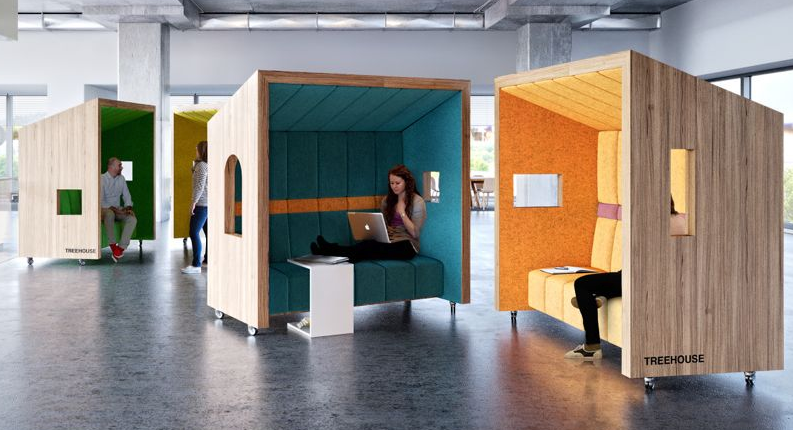 Aptly called TREExOFFICE, this artsy blend of treehouse and office provides fairweather outdoor productivity. Given the roofless design, you’ll want to pick your rental day(s) very carefully! All this to say, If you’ve given up on building a treehouse, in the sky, you may be able to build one in the office!